If you want to know about writing action scenes, who better to ask than an author of action-packed YA stories for boys. I’m excited to welcome S.J. Kincaid. 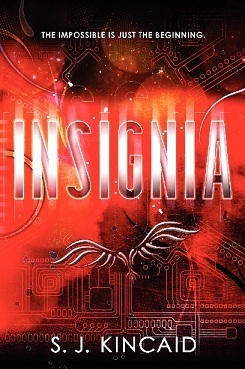 Her YA dystopian novel Insignia (Harpercollins) is due out July 10. My son and I can’t wait to read it! Thanks for letting me guest post, Stina! Okay, the truth is, I dread writing action scenes. Given the sheer number of action scenes I included in INSIGNIA, this assertion may strike those who have read the story as odd, but it's true. As my manuscripts approach those moments I need to have violent clashes, I always feel a terrible reluctance to proceed, like I'm about to head to the dentist or attack a sink overflowing with dishes. I dread writing them because the best action scenes must be set up a long time before the action actually takes place, and there are a lot more considerations to keep in mind than just the technical aspects of throwing punches, or the coolness of giant explosions. I'm going to focus here on an action scene I think is absolutely awesome: the climactic fight between Bigwig and General Woundwort in the middle of the final battle of WATERSHIP DOWN, by Richard Adams. There are some awesome moments in the battle between other characters, but I'm just going to zoom in on these two. Any writers querying agents have probably read the conventional wisdom: "Never start a novel with a fight scene." Why is this? Because we don't know the characters, we don't know the antagonists, we don't know the stakes, so we're not sure why we care about this fight. This same line of reasoning explains why we do care when we encounter fight scenes: because we know the protagonist, we know the antagonist, we know the stakes. 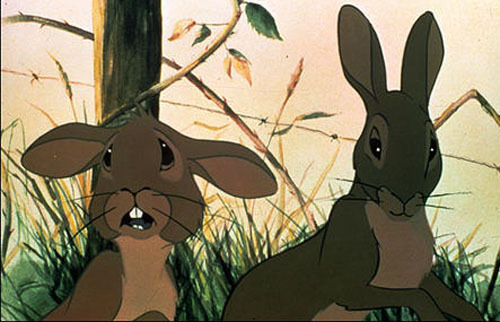 With that said, let me go into why the fight sequence of Watership Down is awesome. By the time of this battle scene, the reader is firmly attached to Bigwig. He starts off as an off-and-on antagonistic character to Hazel (the main character), and Fiver (his brother), but they've formed a solid bond of trust by now, and through that bond, we’ve bonded with Bigwig. Bigwig's immense size and strength render him a critical source of support for Hazel, who is now chief rabbit of the new warren, Watership Down. He's also exhibited his humanity (er, rabbit-anity?) on several occasions, most notably when rescuing a tortured rabbit, Blackavar, from the grasp of General Woundwort, and when befriending the seagull, Kehaar. We want Bigwig to live, and we’ve seen enough deaths of other rabbits to realize it is not a given that he’ll survive. From the moment of General Woundwort's introduction, it's clear he's the largest, most frightening rabbit in existence. He's the leader of an almost fascist network of warrens, he survived on his own in the wild (unheard of), his sheer size is staggering, and even the closest thing the Watership Down rabbits have to a WMD (the seagull Kehaar), is batted contemptuously aside by this fearsome rabbit. By the time Bigwig and General Woundwort are ready for their huge brawl, we've learned to fear this rabbit through the other rabbits who know of him. This is a worthy enemy for Bigwig. Part 2 of the post will continue on Wednesday. Do you enjoy writing action scenes?